I had a little epiphany during a 5 man a few nights back, and am going to timestamp it here. It's not so much a question of If but When. It's also not some major gameplay enhancement, but more of a 'we're already 87.2% percent there, let's just go all the way'. The Need before Greed window is going to get a new button. Vend. 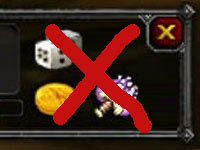 the vend button will become available if a certain trade-skill is present. I'll give you a hint: they can drop a vendor inside runs. No, wait... having the gold piece and the dollar sign is confusing for the user. to vend it later or put it on the AH is up to you. (while still having the point be indicated by a small stack of gold pieces). This meshes up with the existing 'disenchant' motif. I believe the dice should be changed from Need to Playing Craps. It will make the game much more addictive. Does vend beat greed? Or no? If not, then why not just hit greed to beat all the vent rollers? I'm reminded of Gevlon's "greed with compensation" idea. Maybe I'm taking this too seriously. Greed/DE/Vend are all variations on 'I won't wear it', and stand on equal footing. Similar to how Greed/DE already operates. The rationale for the DE button being added to the frame was that everyone could hassle the enchanter at the end of the run, the button itself is just a shortcut. The rationale for Vend is that everyone could similarly just ask for a Jeeves at the end of a run to just vendor their greens for gold. I honestly just don't care for enchanting mats anymore, and usually just sell my greens rather than put them up on the AH. This would shortcut that process. The problem with assuming that hitting Greed means "I won't wear it" is that if the item isn't of the highest armour class that you can wear you just can't hit need. I don't know how many times I ran into this doing heroics on my resto druid. I had to have my mage friend need on the cloth items that I could use then trade them to me. yeah, but that's a problem with the armor system itself. A solution to that would be to realize that balance druids want to wear cloth, or (zomg!) just say 'druids can ONLY wear leather'. That warriors can wear cloth, but gain no benefit, is a stupid mechanic. Why can't mages wear (and just get no benefit from) platemail? It's a topic I've explored before (http://www.ixobelle.com/2008/10/mages-and-platemail.html), and just feels lazy.